This is it, the 30th and last official posting day of the 2013 WordCount Blogathon – and I met the challenge and didn’t miss any day in June. Yay! I’m so glad I participated in what was my first event of this type, especially because it pushed me to finally build the type of travel blogging site that reflects where I am now in my writing career and taught me about the types of posts that I most like to write, the ones that get the most views, and the ones that do both. That third category is where I’ll be aiming my topics going forward whenever possible. It looks like Orlando, French, and Park are among the absolute most popular. Although I hear that these lists change as more blog posts go up, it’s a nice way to see if the words I’m obviously using a lot are ones I’m proud of and are what I most want to write about. And I’d say I’m pretty happy! By the way, when the actor Colin Firth was on Inside the Actors Studio, he said that his favorite word was “get” as in “get going” or “get moving” or “get excited.” So I’m especially pleased to see that “Get” is also one of my most-used words. I think Colin would be proud. 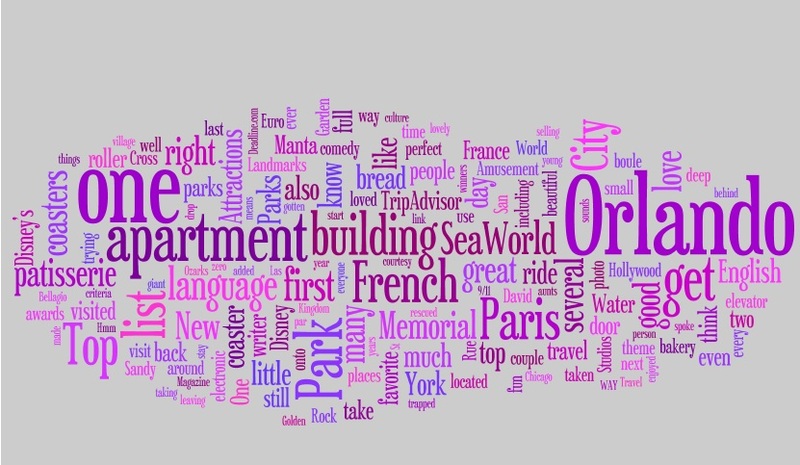 Have you ever created a Wordle word cloud? If so, what were your most used words? Congratulations on completing the 30-day, blogathon for 2013. I followed it all 30 days and looked forward to opening it up each day to see what interesting story you had for that day. Job well done! Thank you, thank you! After a small break for a couple of days, I’ll get back to it. Looks very much like an interesting and attention grabbing logo for your blog. Are there any restrictions on using it for that purpose? That’s an interesting idea! And nope, Wordle has a section on their website specifically saying anyone can use their creations in any way they want. Hmmm, time to think about this!